Image: A young medium played by Carla Bryson hosts a strange array of visitors, but which ones are truly of this realm and which are the ‘operators’? When playwright Fintan Brady first heard the stranger than fiction events surrounding a family of renowned spiritual mediums, the Golighers, from South East Belfast, he knew it was a story he couldn’t let rest in peace. His theatre Company, Partisan Productions, empathetically re-imagines the tale into a new fictional play ‘ A tried and Tested Account of Certain Mysterious Events which have recently occurred in Mersey Street’. 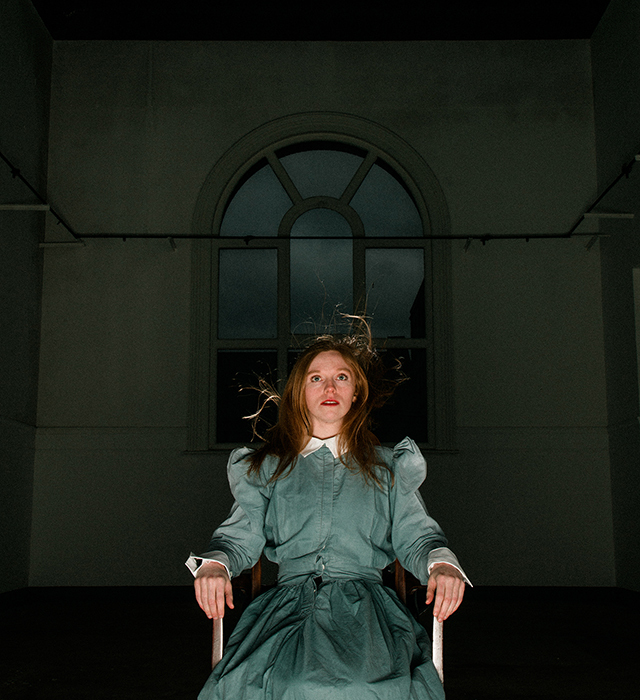 The show opens on the 11 April for a four-day run of performances at the Engine Room in Portview Trade Centre, Belfast. Partisan collaborator, Reggie Chamberlain-King, had researched the story of the Goligher family for his book ‘Weird Belfast’. Kathleen Goligher, held séances which were regularly observed and investigated by a Doctor of Engineering at Queen’s University, Dr W J Crawford from 1914. Crawford attributed levitating tables to the physical force of rods of ectoplasm, exuding from the young lady’s person, which he wrote about in three books that are in circulation to this day. Brady explains how he was “intrigued by the story and the need for injured personalities to collude in comfortable self-delusions “. Using the Goligher tale as a starting point, the plot fast forwards to a 1920's Belfast emerging from the Spanish Flu pandemic and blighted by Sectarian riots. James Lecky plays the role of Dr Dawson whose life is in chaos, as he embarks on a relentless mission to explain the strange phenomena occurring in a small house on Mersey Street. A young medium played by Carla Bryson hosts a strange array of visitors, but which ones are truly of this realm and which are the ‘operators’? Above all, if there is deception at hand, who is deceiving who and where might it lead? In the true spirit of community arts, admission to the show is free, thanks to other supporters including the Arts Council of Northern Ireland, Belfast City Council and the Community Relations Council. Performances will be in the Engine Room of Portview Trade Centre, from 11th April to 14th April at 7.30pm. Designer Conleth White and Musical Director Reggie Chamberlain-King have transformed the cavernous room with deep red lighting, steampunk effects and original music performed by a live band to create an immersive Edwardian tale offering a timeless exploration of human loss, yearning, regret and the need to connect. Free admission. Booking advised. Contact Karen on 07701008852 or partisanproductions@hotmail.com to reserve seating.